The original Hillman Minx was a mid-sized family sedan produced from 1931 through the World War II. 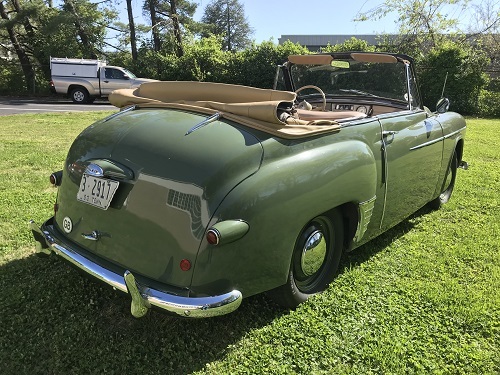 In 1948, a more modern-looking Minx Mk III debuted, complete with ponton styling (headlights integrated in the fenders, no running boards) that came in three different body styles: 4-door sedan, a 2-door cabriolet, and a wagon. The Minx was part of the Rootes Group’s “Audax” platform, which also included the Singer Gazelle and Sunbeam Rapier. In Japan, the Minx was called the Isuzu PH-10 from 1953-1961. Minxes were sold in New Zealand under the Humber name from 1949-1967. In Iran, it was assembled and marketed as the Peykan. The Mark VI of 1953, like the one seen here, featured a new grille, revised combustion chambers, turn signals instead of semaphores, and a two-spoke steering wheel. A fourth body variation was also added, the two-tone, pillar-less, hard-top coupe known as the Californian, in an effort to appeal to American tastes. 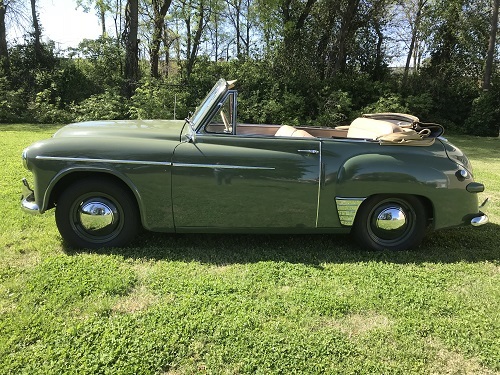 This Minx Mk VI was one of the 4,506 Mk VIs sold in the US; it was purchased new by Victor Morrison, Jr. of Old Lyme, Connecticut for his wife, Betsy. Their children Victor III, Park, and Susan learned to drive in this car, and it remained in service until the mid-’80s. It was stored in a barn for many years and was ultimately sold to Mike Fuller of Knoxville. While stored, the top and upholstery had rotted away, the floor pan and fenders rusted through, mice ate through the wiring, the brakes and engine seized, and the paint oxidized. The car was completely disassembled, each part being rebuilt, packaged and stored. Mysteriously, beneath the rear seat was written in chalk, “Last Green”, meaning unknown. 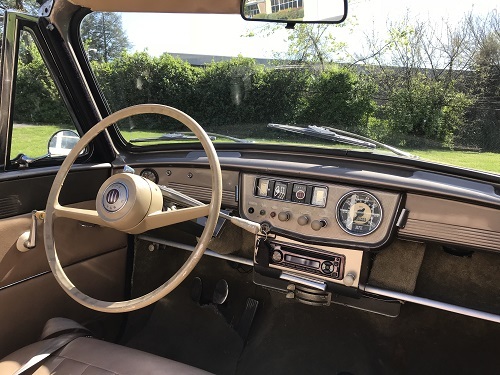 After its restoration, the Hillman won first in class at several auto shows and became Mike’s weekly driver until recently. 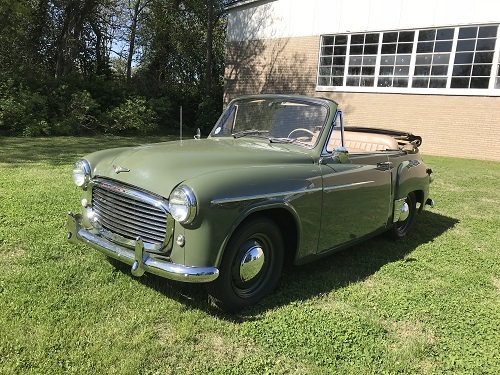 Mr. Fuller generously donated it to Lane Motor Museum in 2018. Original Cost: £510 (car) + £284 (tax); included radio and heater; $1,899 USD.